This case note concerns a father who appealed against the trial judge’s refusal to disqualify himself from continuing to hear proceedings. However, the substantive proceedings were transferred to to the Federal Circuit Court of Australia and there were questions regarding whether the appeal was consequently futile. His Honour considered that leave not required for the Appeal – it was a matter of right (given the nature of the appeal) – see further below. The father filed a Notice of Appeal seeking leave to appeal, and if leave is granted, to appeal against an order made by Berman J on 9 February 2018 dismissing the father’s Application in a Case filed 11 December 2017 for His Honour to disqualify himself from continuing to hear the proceedings on the grounds that the father contented that His Honour had prejudged the matter without hearing the totality of the evidence, and his Honour’s conduct during the course of the interim hearings raised a reasonable apprehension of bias. The father has pursued his appeal, despite the order made on 1 June 2018 transferring the proceedings to the Federal Circuit Court of Australia. However, in my view, the effect of that order is that it renders this appeal futile. The proceedings have been transferred to the Federal Circuit Court of Australia, and I understand that they have come before a judge of that Court, and that judge has listed the matter for trial in October 2018, and, thus, Berman J will not be hearing the matter. The mother raised matters in her summary of argument prepared for the appeal, however, she did not wish to appear at the hearing of the appeal. She filed a Submitting Notice indicating that she would submit to any order made by the Court, and that she did not wish to be heard on the question of costs. …the authorities appear to indicate that leave to appeal is not required from the dismissal of a recusal application by a judge of the Family Court of Australia. See Pencious & Searle  FamCAFC 210; (2017) FLC 93-805 at ; XYZ Pty Ltd& Charisteas (2017) FLC 93-782 at . I agree with those authorities. Thus, leave is not required, and the father is able to pursue an appeal as of right. the nature, number and tone of the trial judge’s interventions during counsel for the father’s submissions on 3 November 2017. Having carefully read the transcript of the hearing on 3 November 2017, I am not persuaded that the father has demonstrated that anything said or done by the trial judge on that occasion, was such as it demonstrated any prejudgment on the part of the trial judge. Strickland J considered that the appeal should be dismissed. 45. … sense of grievance arising from the fact that having expended a significant sum of money on legal fees, and having waited for a very significant period of time to get to trial in the Federal Circuit Court of Australia, the matter was only then transferred to the Family Court of Australia. That is most unsatisfactory and unfortunate. However, I too am not persuaded of the utility in this appeal, nor, in any event, in its merits. I agree the appeal should be dismissed for the reasons expressed by Strickland J. Justice Kent agreed with the orders proposed by Strickland J, and with his Honour’s reasons, and with the further comments made by Murphy J. (1) The appellant father have leave to rely on the Appeal Books as filed and his Amended Summary of Argument filed on 20 August 2018. (2) The appeal be dismissed. This article does not represent the views of the firm. 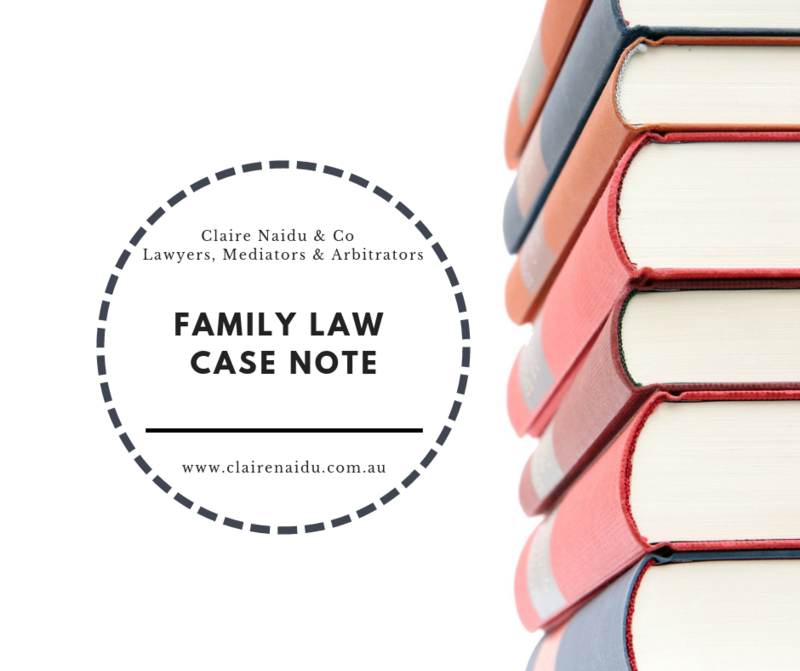 It a case note based on a decision made in the Family Court of Australia in relation to a family Law Appeal. If you are seeking advice in relation to a family law court appeal, or family law matters such as divorce or property settlements, contact Claire Naidu & Co, Lawyers and Mediators for family law advice. Click here for our contact details. Note: This blog does not constitute legal advice and Claire Naidu & Co is not responsible for any reliance upon its contents.